Rumble Falls in Super Smash Bros. Brawl. 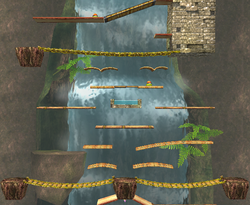 Rumble Falls (大滝のぼり, Large Waterfall Climb) is a stage for Super Smash Bros. Brawl, based off the Donkey Kong franchise, specifically Donkey Kong Jungle Beat for the GameCube, and was later remade for Wii. It was revealed on Smash Bros. DOJO!! on July 23, 2007. If one counts the whole stage, it would be the biggest stage in the game. Similar in concept to Icicle Mountain from Super Smash Bros. Melee, Rumble Falls requires the characters to climb upwards on a series of platforms until they reach the top; once the top is reached, the stage background fades into the starting waterfall and restarts itself. Randomly throughout the stage, a flashing warning sign that reads "SPEED UP!" appears and the stage scrolls quicker. There are ladders in the level that characters are able to climb. The stage also features buttons at various locations which activate traps or move platforms. There are spikes throughout the level which deal damage and knockback. The first lone spike has enough knockback to OHKO any character if they don't tech. Donkey Kong at the base of the waterfall in Rumble Falls, as seen in Donkey Kong Jungle Beat. This stage is based on two stages in Donkey Kong Jungle Beat. The bottom half of this stage is based off of Rumble Falls, which is the first level of the Pineapple Kingdom. In each level in Donkey Kong Jungle Beat, Donkey Kong must maneuver through obstacles in order to reach a giant fruit. In Rumble Falls, the giant fruit is a pineapple. Rumble Falls in Donkey Kong Jungle Beat is mostly a vertical stage that involves going through obstacles to go above a waterfall. The overall design of this part of the stage in Brawl is somewhat retained with minor differences; however, the layout of the stage is different. In Brawl, the stage features switches, ladders, and spikes, which weren't present in the original stage. Donkey Kong progresses through the Sky Garden stage of Donkey Kong Jungle Beat. The top half of this stage is based off of Sky Garden, the second level of the Orange Kingdom. In Sky Garden, Donkey Kong's goal is to reach a giant orange. The level features large vines in the background, which hold up large stone blocks. Sky Garden is mostly a horizontal stage that involves going through obstacles to get from one side of the stage to the other. The overall design of this part of the stage in Brawl is somewhat retained, including the giant vines in the background, though adapted into a vertical level. In Brawl, there are spikes, moving platforms, and an airplane, which weren't present in the original stage. Rumble Falls is banned from tournaments for some of the same reasons that got Icicle Mountain banned: its rapid vertical auto-scrolling causes gameplay to focus on surviving the movement of the stage rather than actual fighting and gives a disproportionate advantage to characters with good jumps and/or up specials that give good vertical distance, keep their user in the air for a long time, and/or are executed quickly. Also, characters who rely on a tether to recover are hurt by the lack of grabbable ledges, and the first spike is a ridiculously powerful stage hazard due to having one-hit KO potential (though it can easily be teched). Ladders and various other platforms. Donkey Kong about to attack Wario with a Giant Punch. A view of Rumble Falls. When playing as the Pokémon Trainer, the Pokémon Trainer will teleport higher up whenever the camera leaves him behind. Similar effects occur during the Subspace Emissary. Stationary Final Smashes, like Negative Zone and Konga Beat, scroll with the stage, though Konga Beat will only move if performed in midair, but the stage will scroll much more slowly if DK is on the ground or in midair. Some other Final Smashes slow down the scrolling of the stage. End of Day completely stops the scrolling. Bramble Blast, which plays on this stage, is one of only two tracks that play on a Donkey Kong stage to be unlocked by collecting a CD - the other is Kongo Jungle (Melee), which plays on the returning Jungle Japes stage (all tracks on 75m are unlocked with the stage, and all the other music pieces on Rumble Falls are available from the start). The stage will not show the "SPEED UP!" warning when a Smash Ball appears. Rumble Falls is the only stage that debuted in Brawl that isn't represented in some way in Super Smash Bros. Ultimate; while the original PictoChat and Flat Zone 2 are absent, their successors, PictoChat 2 and Flat Zone X respectively, are used in the game. This page was last edited on April 16, 2019, at 15:32.